Destroyer at the Commodore Ballroom, Vancouver, Oct 17 2015. Kirk Chantraine photo. Dan Bejar has always been a rather low-key performer. With Destroyer, the Vancouver singer/songwriter creates some of today’s most intricate and ambitious music. But onstage, he comes across as cool and restrained. During the last show of the band’s North American tour, which happened to be in Bejar’s hometown, the frontman rarely spoke to the audience. Instead, he let his music do the talking. Destroyer’s more recent work, including Kaputt (2011) and ken (2017), is characterized by lush orchestrations and synth-pop wonders. It was only fitting for Mega Bog to open the show. Led by multi-instrumentalist Erin Birgy, the Seattle band toys with futuristic beats, lounge rock and jazz frenzies. For this performance, Mega Bog opted for a more traditional, guitar-based arrangement, save for the odd flourish of a clarinet. Aside from the occasional yelp, Birgy’s voice was quiet but alluring, enticing the audience to listen closely to each swift and staccato note. However, the band didn’t receive the kind of attentive treatment it deserved. Throughout, Mega Bog’s performance was drowned out by the hum of conversation emanating across the entire venue. At one point Birgy politely asked the offending people to stop talking, even mentioning that she couldn’t hear the sound of her own guitar over the noise. She became visibly frustrated, but the band pushed through with more vigor while the receptive portion of the audience cheered them on. For those that were paying attention, it was a treat to hear Mega Bog’s dreamy soundscapes and Birgy’s celestial vocals in particular live. By the time Destroyer took the stage, the theatre was at capacity, but the band wasn’t troubled by the same issues as the opening act. Most of their set was pulled from ken. The eight-piece band immediately dove into the first three, upbeat tracks from the album, “Sky’s Grey,” “In the Morning” and “Tinseltown Swimming in Blood.” Each song blended into the next in a hazy flow, allowing the audience to find its groove. Now and then Bejar crouched down to take a sip from his beer, surveying the entranced crowd with a blank expression. Destroyer’s fully-rounded sound can be attributed to its brass and woodwind sections. Trumpeter JP Carter anchored many of the songs with deep and luxurious tones pouring out of his horn. On the rococo gem “Suicide Demo for Kara Walker,” Joseph Shabason deftly alternated between saxophone and flute. Fans clamored with joy as soon as they recognized the song within the first few notes of Shabason’s airier instrument. Bejar even took a break from his vocal duties to play tambourine—but naturally, did so in a detached fashion, facing away from the audience. The band went off script a couple times in an otherwise seamless set. During “Rome,” there were moments when Bejar abandoned his lethargic drawl and offered a few unexpected shrieks. Similarly, parts of “Bay of Pigs (Detail)” had band members of jamming a bit longer than necessary, causing Shabason to grin or even laugh during these unforeseen artistic liberties. The band seemed to savour each moment of their final night together on this tour. It was clear that on stage was a group of longtime friends who genuinely enjoyed playing music together. Before the encore unfolded, Bejar introduced “Looter’s Follies” from 2006’s Destroyer’s Rubies as an “old-timey song.” Given that Destroyer has been making music since ‘95, it was an interesting statement, but a sensible song choice for their finale. That transitioned into “Chinatown”, a recognizable tune off of Kaput that had everyone swooning. Without another word, the frontman walked off-stage and the lights went up. The audience was left in a daze, lingering a bit longer as if hoping the night wouldn’t end. 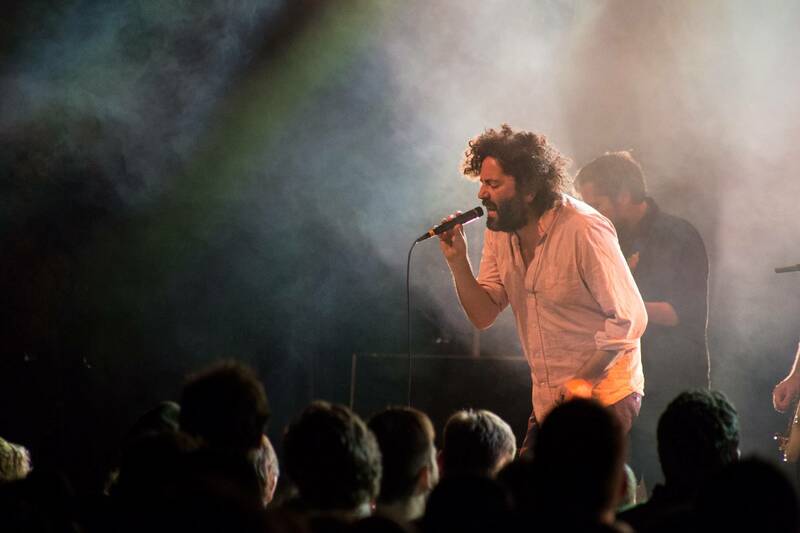 This entry was posted in concert reviews, Homepage Features and tagged Commodore Ballroom, Dan Bejar, Destroyer, indie-rock, Seattle bands, Vancouver bands, Vancouver concerts, Vancouver show. Bookmark the permalink.